The largest wooden ship ever built in South Carolina is taking shape under Bill Brady’s house in Litchfield. Naturally, space is a problem. “How am I going to get my hands in here,” Brady wondered as he unpacked 20 feet of line to rig the foremast. Tweezers would help. 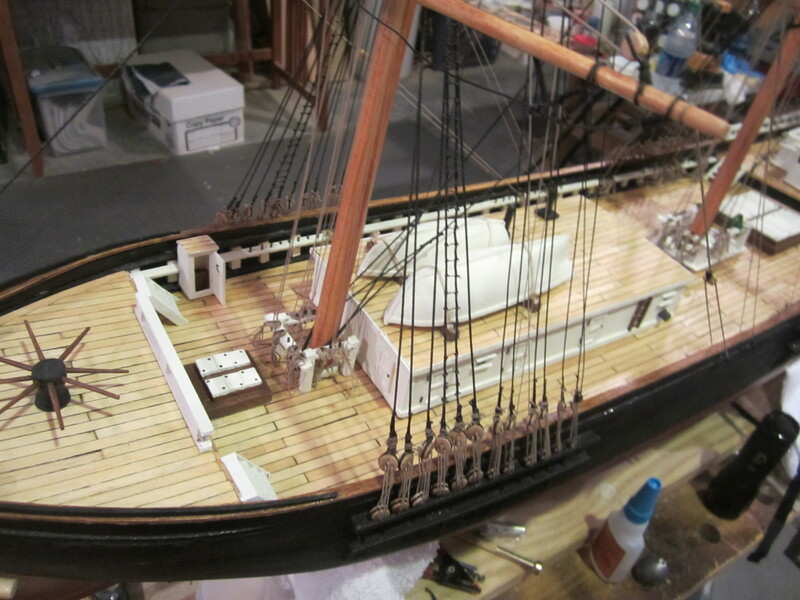 Brady’s model of the Henrietta was commissioned by the S.C. Maritime Museum in Georgetown. It’s 1/64th the size of the original. But it’s taken just as long to build. The Henrietta was the subject of an exhibit at the museum in 2014. It was built at Bucksville on the Waccamaw River, the community founded by a shipbuilding family from Maine. Rather than send South Carolina lumber north, one enterprising captain sent his shipwrights south in the 1870s to build a square-rigged cargo ship. 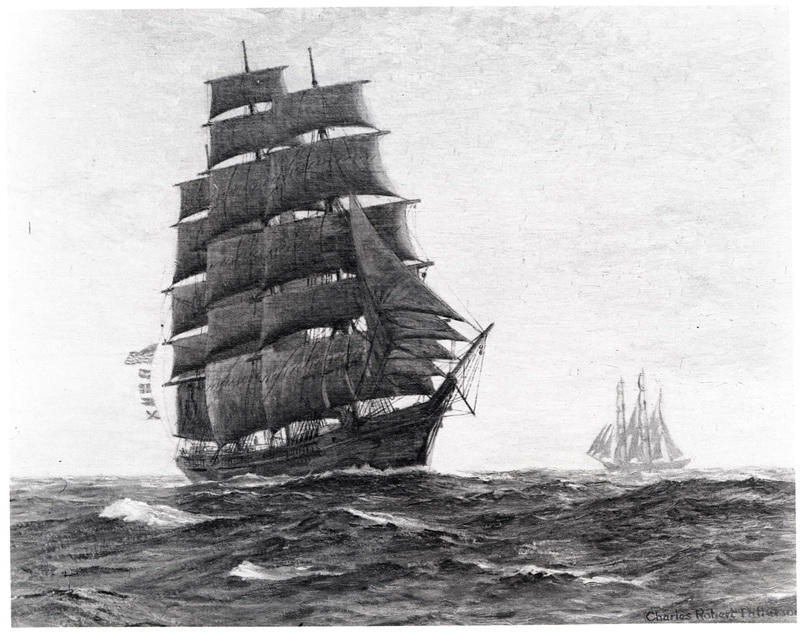 The success of that project – the 240-ton Hattie Buck – led to construction of the 1,200-ton Henrietta. Work began in the fall of 1874 and the ship was launched in April 1875 with her three masts still on deck because of the trees overhanging the Waccamaw between Bucksville and Georgetown. The Henrietta was towed by a steam-powered tug to Charleston for rigging. She was 201 feet long and the top of her mainmast was 147 feet above the deck, the largest wooden sailing ship ever built in the state. The Henrietta carried cargo for 19 years, mainly on routes to the Pacific. In 1894, she ran aground off Japan in a typhoon and was broken up and sold for firewood. Mac McAlister, the maritime museum director, documented the history of the Henrietta in his book “The Lumber Boom of Coastal South Carolina.” It took 1.3 million feet of pine boards to build the ship. “I wish I’d used pine for the decking,” Brady said as he surveyed his model. Instead, he used basswood. But he built his Henrietta about the same way the New Englanders did in the 19th century, laying down the keel and working his way up from hull to deck to cabins. Masts and spars came last. One thing the original builders had that Brady lacked was a plan. The model is based on drawings by Ed Scott, a naval architect who used a photo of the Henrietta to recreate the plan. 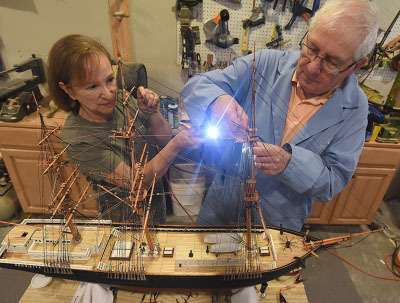 Brady and Scott worked together on the model of the Browns Ferry Vessel, an 18th century craft, that is in the maritime museum’s collection. For Brady, the challenge is in the process. He isn’t a sailor. He spent 23 years in the Air Force doing aircraft maintenance and another 20 years at The Citadel in procurement. He knows how to build things. In his home office is a ceremonial hammer that reads “For the Dad That Can Fix Anything.” And he knows how to get the right materials. The ship has two kinds of rope: the standing rigging that holds the masts upright and the running rigging that controls the sails. The original had 24 sails. The model has bare spars. Brady had to figure out how to rig the ship so he could reach all the lines, some as small as 18/1,000ths of an inch, without becoming tangled. “It’s like a fishing expedition,” he said. The running rigging is secured to belaying pins on deck in seamanlike fashion. That’s the kind of detail Brady likes. Although the Henrietta is his largest project, one of his favorites is a shrimp boat that’s also in the S.C. Maritime Museum. “Most model boat builders have a theme. My theme is building something I like,” Brady said. And what he likes is detail. Brady’s models of duck hunting boats are complete down to the shotgun shells and Coke cans. The Henrietta is a challenge because of the scale, but it still features details such as hinges and knobs on the cabin doors. There’s also a privy near the starboard bow, a half moon cut in its door. 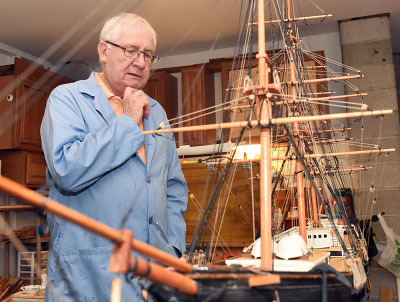 He would like to build more models of historic South Carolina work boats, but it is hard to find references that show the details, Brady said. Although he has studied a photo of the Henrietta, it often left questions unanswered. “The rigging looks like spaghetti,” he said. The process of building a model is a voyage of discovery. The Henrietta’s hull was broad to carry cargo, but not so deep that she couldn’t get into ports of varying depths. The tall masts made her a fast sailer. And she was built in six months not 20 miles from Brady’s home workshop. “It’s amazing that they could do this,” Brady said.